Maureen Valentine is a TCi Scholar and a second year Ph.D student in the department of Animal Science at Cornell University. She will begin one year of field-based research in January 2016. 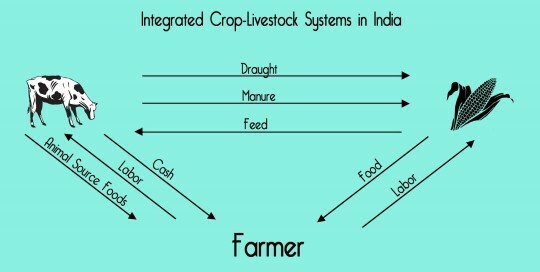 Agriculture in India is predominately organized into integrated crop-livestock systems, which depend on a crop-livestock collaboration to sustain households’ nutrition and economic needs. Because the dynamic interactions on-farm can be complicated to conceptualize, many scientists in the field of agricultural development narrowly focus solely on crop cultivation or livestock management, with a much stronger emphasis on crops (Thorne and Tanner, 2002). While working in international development and coming from a background in Animal Science, this has certainly been my personal observation that development is mainly focused on crop yields rather than optimizing whole system interactions. At the 2nd International Global Food Security Conference recently held at Cornell University in October 2015, Alberto Zezza also argued that livestock has been grossly under-represented in agricultural development research (Carletto et al., 2015), and linkages between livestock and maternal and child nutrition have proven strong in some African countries. Livestock must be investigated more thoroughly, and equally as much as crop production, to tell the full story. TCi realizes that if we exclude livestock from our concept of agricultural and nutrition in India, we are omitting a valuable system component. Livestock provide benefits such as manure, animal source foods (meat and milk), cash, and draught power. Additionally, as Delgado predicted with his theory of the ‘livestock revolution’ (Delgado, 1999), India’s livestock population is growing as demand for animal source foods rises with an expanding human population, income growth, and urbanization. A growing animal population has been coupled with a growing human population and decreased available grazing land (Government of India, 1999). As land pressure becomes more severe, we are beginning to observe widespread degradation. It is easy to see how this chain of events can have serious implications for the environment. Therefore, it is imperative that we theorize about how livestock systems can be intensified in a sustainable manner so that negative impacts of livestock are mitigated. On this thought projection, I will be going to India in early 2016 to begin a project that will consider the trade-offs involved with intensifying the traditional, 100% grazing systems common in India. 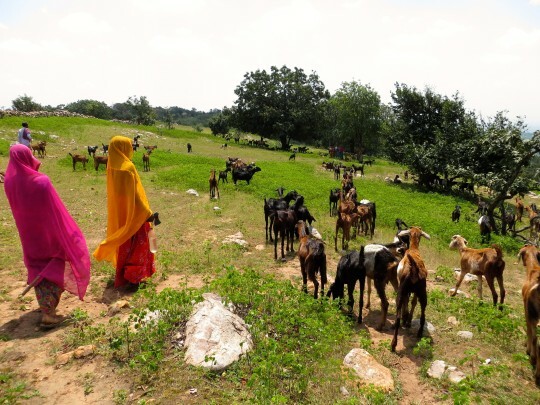 We will be looking at goats in particular because goats are the most common meat consumed in India, and the goat population expansion has exceeded any other livestock over the last 20 years (FAO stat, 2014). 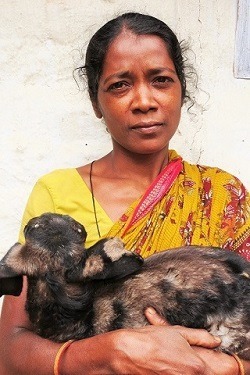 Goats provide an opportunity to target marginalized groups with improvements to the industry because they are generally owned by the poorest sectors of India’s population. There is also a women’s empowerment opportunity because women are the primary caretakers of small livestock, which offers women a valuable source of income and influence within households. This project will take into account several aspects of the livestock management system and look for potential trade-offs associated with a shift from the traditional, extensively managed system to a semi-intensive management system. We will record household income, labor requirements, animal health and nutrition, environmental degradation, human nutrition, and women’s empowerment changes over one year. A participatory research approach will be employed with farmers before and after the intervention to evaluate receptiveness, and all relevant stakeholders will be incorporated throughout the project’s inception, implementation, and conclusions. This research will inform policymakers about how a change in management system could affect livelihoods, animals, and environment. A better understanding of the trade-offs involved with livestock management adjustments will be essential when making land-reform policy revisions as the government contends with the challenge of preserving increasingly degraded land while maintaining peoples’ livelihoods. Stay tuned as I travel into the field and establish this ambitious research project to inform animal agriculture and land policy!